Diabetes In Mexico: A Challenge To Improve Diet And Exercise : Goats and Soda To curb diabetes, Mexico is trying to get people to cut down on soda, eat more healthful foods and exercise. But changing people's habits is easier said than done. Dr. Tonatiuh Barrientos Gutierrez, an epidemiologist in Mexico City, jogs near his home in the southern part of the capital. He says it's hard to run on the city's streets. Let's say you'd like to go for a run in Mexico City. Dr. Tonatiuh Barrientos, an epidemiologist with Mexico's National Institute of Public Health, thinks that's a good idea — in theory. An expert on diabetes, he'd like to see more people in the Mexican capital get out and exercise to combat the disease. But as a runner himself, he knows that Mexico City isn't an easy place to jog. In a metropolis of 22 million, there are only a handful of parks where people can run. "Look, this is a fairly crowded street. It's a pretty noisy street. 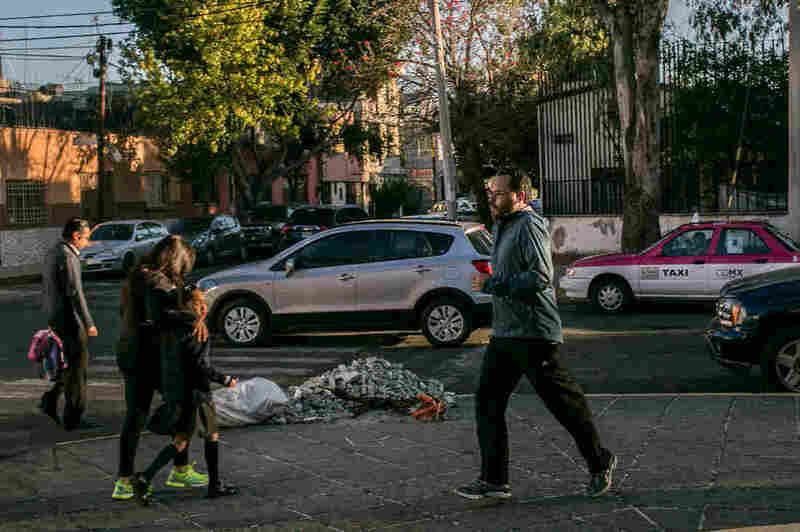 It's polluted," Barrientos says walking through the Tlalpan neighborhood that lies between his office and his home. "Now just imagine trying to convince yourself to get out there and run." Runners in the wooded park of Viveros in Coyoacan, Mexico City. 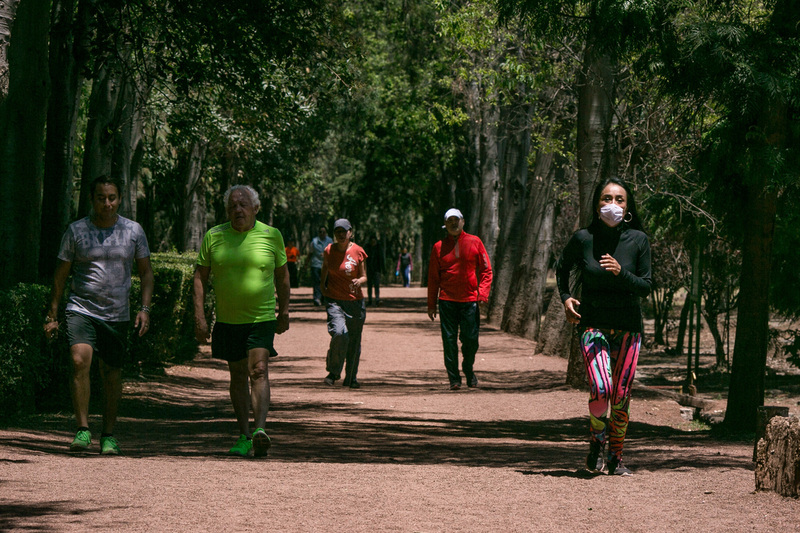 Mexico City has few runner-friendly spaces. The altitude discourages exertion and the air quality is often so bad some runners wear face masks. Yet health officials urge people to exercise more. It's a tough sell. "I mean the only place for you to really run is on the sidewalk. You can't run on the street because you'll probably get run over," he says. The sidewalk is an uneven mix of broken cement slabs and cobblestones. Street vendors have set up little tables and carts to sell everything from electrical supplies to fried pork cracklings. There are so many people that it's hard to even walk at a fast clip. And if you do manage to find a stretch of sidewalk, the elevation in Mexico City combined with the smog and the chances of getting mugged make running a hard thing to get excited about. "There are a lot of obstacles," Barrientos says as he dodges his way past low-hanging awnings. "And you need to deal with that if you wanted to try to run here." Professionally, Barrientos has tracked the slow, steady rise in Type 2 diabetes in Mexico. Roughly 14 million Mexicans are now living with diabetes — nearly triple the number who had the disease in 1990. Barrientos says for too long health officials considered it the responsibility of patients to change their diet and exercise routines. They either did it or didn't. He says now it's become clear that addressing one of Mexico's biggest health crises requires changes at a much higher level and includes lobbying for healthier public spaces where people can easily get out and exercise. 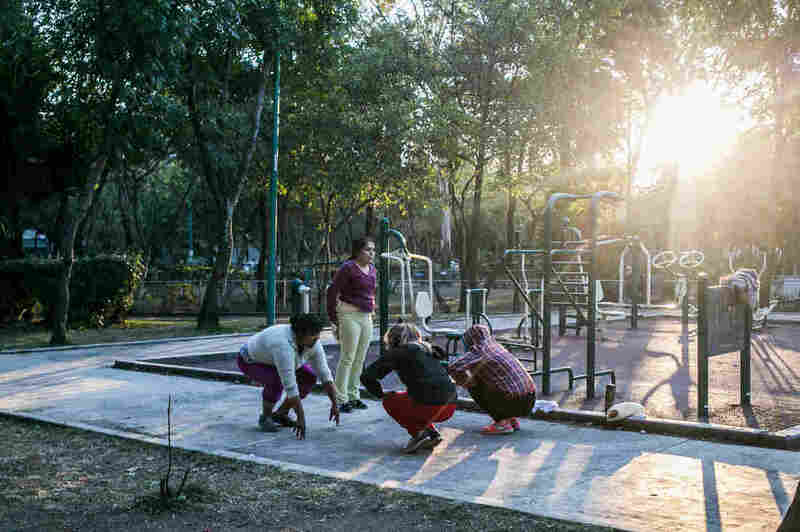 Exercise equipment, often placed in public parks like this one in the Tlalpan area of Mexico City, encourages residents to be more active. "How do we change the world so that making healthy decisions is a lot easier than it is right now?" he asks. Diabetes has mushroomed as Mexicans' lifestyles have changed dramatically over the last 40 years. Several generations ago diabetes was almost unheard of in Mexico. Now it's the leading cause of death, according to the World Health Organization. Mexicans with indigenous ancestry have a genetic predisposition for the condition that makes them even more likely to develop it than Caucasians. 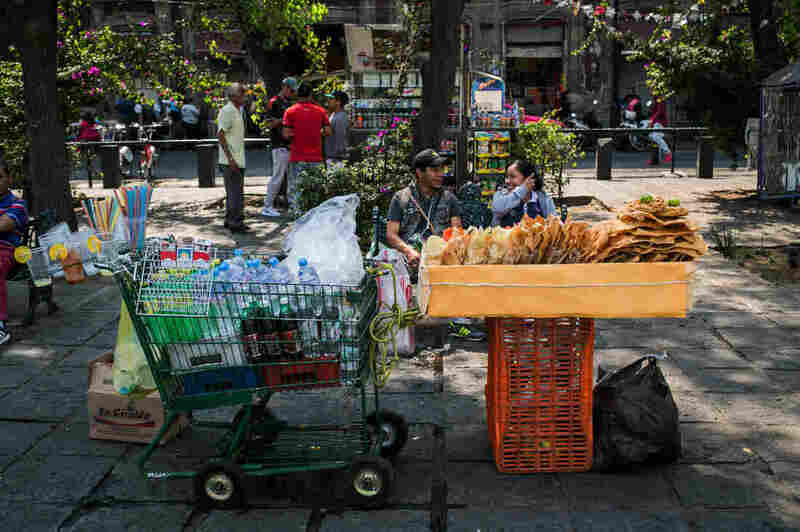 But a key driver of Type 2 diabetes in Mexico — and globally — is still a person's diet. Barrientos says current projections show that by 2030, 17 percent of all Mexican adults will have diabetes. "And that of course opens a lot of questions about sustainability," he says. "Can you really sustain a public health system with 17 percent of your population being diabetic? Especially if you are not prepared to control that diabetes." Some epidemiologists predict that by 2050, half the adults in the country could suffer from diabetes in their lifetime. Type 2 diabetes can be reversed with weight-loss surgery in some cases. Uncontrolled, the metabolic disorder can have grave health consequences. It can lead to blindness, nerve damage, kidney failure and, in some cases, foot amputations. Barrientos and others are now saying the focus of diabetes prevention in Mexico needs to shift away from shaming individuals to looking at new government policies to tackle this mounting health crisis. "With tobacco we faced the same thing for many, many years. We were trying to encourage people to quit: Because if you don't quit you're going to die!" he says. "The only time that we started to see real change was when we said, 'We are going to change the rules of the game.' The more expensive it is the less you're going to be willing to spend your precious money on something that isn't good for you." In an effort to reduce soda consumption, the government in 2014 imposed a 1 peso per liter tax on sugar sweetened beverages, the equivalent of about 10 U.S. cents on a standard 2 liter bottle. At the time Mexico was the leading per capita consumer of soda in the world. In regulatory filings in 2015, Coca-Cola said that the annual consumption of its beverages in Mexico was more than 600 8-ounce servings per person per year. That means that, on average, every Mexican was drinking nearly two glasses of Coke beverages every day. And that doesn't even count the amount of Pepsi or other brands of soda being consumed. Alejandro Calvillo, the head of a consumer group called El Poder del Consumidor, says soda is making Mexicans sick. Walking just outside his office in Mexico City, he points out little shops selling Coke and junk food on just about every block. In fact, the red Coca-Cola logo has become a symbol that declares snack shop. "Coke in Mexico has more than 1.5 million places that sell Coke," Calvillo says. "The presence of these products is everywhere." Calvillo was one of the advocates behind the 2014 soda tax, although he would have liked the tax to have been even higher. A higher tax, he argues, would have pushed down consumption even more and given the government more resources to combat the lifestyle that's linked to diabetes. In indigenous communities in Chiapas, he says, parents put Coke in baby bottles for their infants "and the government isn't doing anything. It's crazy." Like Barrientos, he says that if Mexico is going to successfully combat diabetes, the rules of the game need to change. His efforts to get the soda tax increased even more, however, have so far been unsuccessful. But Jorge Terrazas, the head of ANPRAC, the carbonated beverages trade association in Mexico City, says soda is unfairly blamed for Mexico's extremely high rates of obesity and diabetes. "There's not conclusive scientific evidence demonstrating the relation between the intake of soft drinks with overweight," he tells NPR. The average Mexican's daily intake of calories far exceeds the World Health Organization recommendation of 2,000, and Terrazas says the majority of those calories are coming from things other than soda. But anti-soda campaigners says sugar is a big part of the problem. They say calling for solutions that rely on individuals alone to change their lifestyles won't solve Mexico's diabetes crisis. Barrientos, the epidemiologist and runner, says the solution is going to require major changes to the way Mexicans live, eat and exercise.